Garnier Olia comes with a bottle you use to mix the developer/colourant cream, also making it a lot easier by not getting the dye everywhere.The gloves are fairly great protecting your hands, as I used two boxes, and it didn't go through them.This dye has no ammonia, so you don't have that horrible chemical smell when applying, and it does smell pleasant, not leaving your nose burning at all. I've used this brand before, I had no worries of it disappointing, but unfortunately they were quite a few negatives this time round, which I wanted to share with you. Firstly there wasn't enough colourant in the first box, despite squeezing and cutting the tube at the top, there just wasn't enough, however the second box used in conjunction with it had the normal amount.This caused not all of my hair to be covered by the colourant(picture below), because while waiting for the dye to do its work on my hair, I noticed some patches within 15 minutes of it sitting on my hair, and I made sure 100% that every strand was covered,even my mum helped me with it. It was too late to apply anymore on, plus I had thrown the bottles away so just left it on for 25mins (40mins altogether) and washed it out.It took longer to wash out due to have using more than one dye, but while I was washing it out I couldn't believe on how dry my hair felt and more hair was falling out than usual. Once the water started running clear, I applied the whole after colour conditioner tube to my hair, because it felt so dry and I didn't even look in the mirror because I was so worried about the way it looked.Leaving it on for a few minutes to then wash out, my hair was feeling a bit better, but I knew this was probably down to the silicone's in the conditioner.Knowing that I would have to see the damage eventually, I looked in the mirror to see that not only was my hair damaged, it also a dark shade of blue, with some patches of brown. Today its slightly less dry and I have some of my curl back, but still not 100% to what it was.Depending on if/how well my curls come back, I'm going to have to chop it off, and I'm hoping that this damage is only temporary of having most of the moisture and oils stripped from my hair.I'm still waiting for a reply email from L'Oréal/Garnier on why exactly there was lack of colourant in these boxes, and the amount of damaged caused, maybe due to change of formula?I'll let you know the outcome. 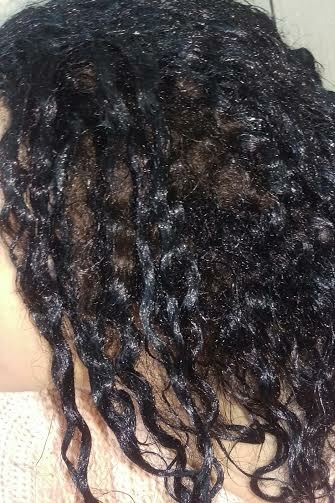 UPDATE 4th September: This morning I treated my hair to a pure coconut oil treatment, in an attempt of restoring my curls.Sectioning my hair, I sprayed water on each section, applied coconut oil root to tip, followed by combing gently. This worked a lot better with my hair soaking up the oi with no silicones stopping it, and leaving my hair soft and moisturised.I've provided a better image of my hair colour comparison and what my hair looked like after a few hours of the coconut oil drying.